We are counting down to the big day(s). Please post a message on our Classmates or Guest Book page so we can know how you are doing. Our class was full of interesting folks we are proud to know. Lynn Bruneau just posted a great comment on one of the pictures below. If you don't see the comments for a photo, click on "show comments." Our 55th Reunion will be the weekend of August 14-15, 2015 – the same weekend that the Sequoia Alumni Association will be holding its annual picnic on campus for graduates from all years. And we'll be joining them. So we’ll be getting together with our own class and with some others, and maybe some faculty, that we also remember. We truly hope you will be there. New photos added to the album on this site. 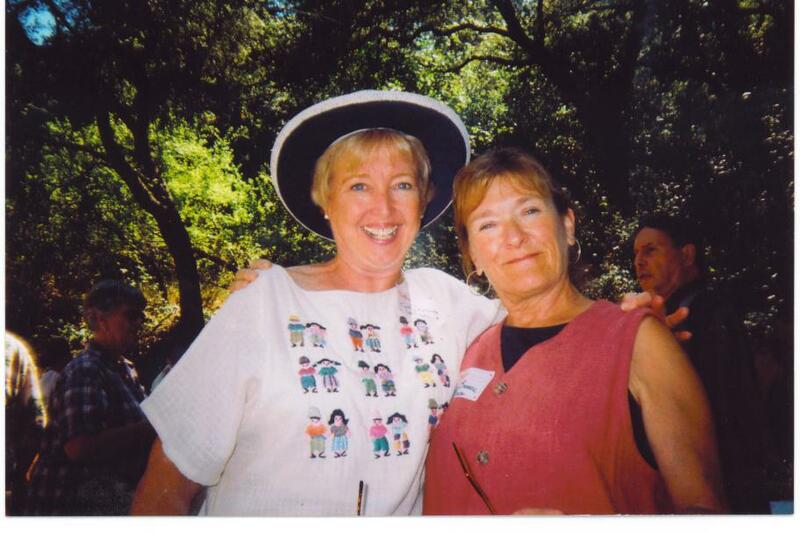 Cathy Kalteren Williams and Lynn Bruneau Bruce at our 45th Reunion. New class photos have been added to the photo album called "When We Were Young." If you view the album as a slide show, you'll need to use the funny little arrows at the bottom to be able to read the names of all of those in the picture. If you view it as a page layout, you can read the names well, but the pictures are smaller. Click on them and they get bigger. Go ahead -- look at them both ways. And thank Alene Kremer and cathy Kalteren for their contributions to our collection on this site. Even if you weren't in any of these classes, you probably knew someone who was - and it is incredible to see how we dressed (and how well we behaved) way back in grammar school. Please get your reservation in -- please, please come to the reunion. You won't realize how important you are to everyone's memories until we walk up to you and ask: "Who did you used to be?"